Korosh Ghazimorad is a renowned Iranian calligrapher and developer of the Sarir calligraphy style. Studying calligraphy in different cultures, Ghazimorad has spent the last seven years of his life creating a new style of calligraphy. He has studied over 40,000 pages of works around the world, interviewed countless artists, practiced many styles, as well as drawing on his own mastery in Persian calligraphy and graphics. A mix of Persian, Chinese and Western methods; the result is Sarir calligraphy, where artworks are soundly composed, melodically harmonious, and aesthetically desirable. 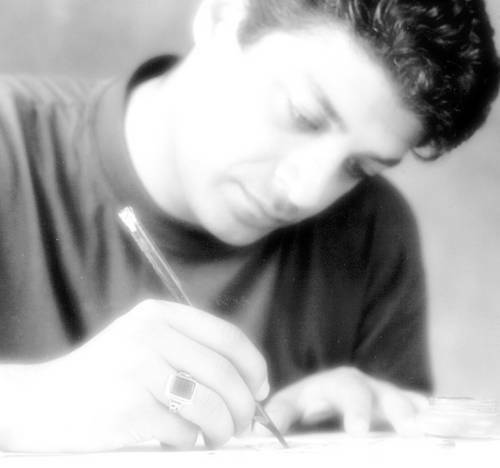 Art Director at various galleries, Professor of graphics and calligraphy design, and member of the Board of Directors in the Iranian Graphic Designers’ Association, Korosh Ghazimorad is an exciting artist and has received several awards for his work such as Winner of the Best International Artist Award at the International Festival of Harmony, Los Angeles.